teaching resources, and a fun student project. 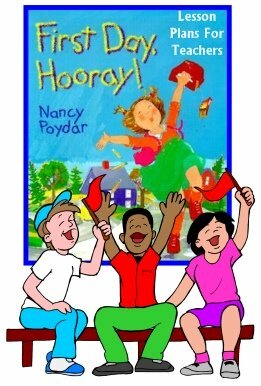 First Day Hooray, written by Nancy Poydar, is a back to school themed picture book that shows the anticipation, apprehension, and excitement that children and school employees feel about the first day of school. All over town, Ivy Green and the school employees are getting ready for the first day of school. It is the day before school starts and Ivy Green is buying new shoes and a lunch box. This picture book also focuses on some of the important people who work at a school: bus driver, custodian, principal, and teacher. Miss Wheeler, the bus driver, is going over her route and has many new stops to learn. Mr. Handy, the custodian, is buffing the floors and arranging furniture. Mr. Masters, the principal, is reading over his notes and organizing welcome signs and materials. Ms. Bell, Ivy's teacher, is hanging alphabet letters and writing name tags. The story shows what everyone is doing the day before school starts to get ready, the dreams that they have that night, and the morning of the first day of school. 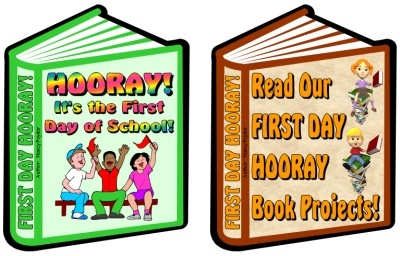 The illustrations in the book capture the anxiety and the excitement that everyone is feeling about the first day of school. 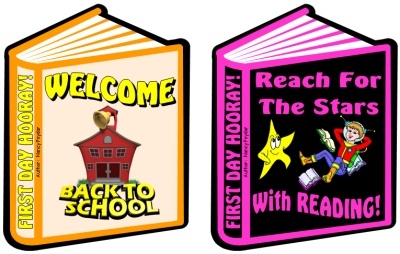 As you are reading this book to your students, there are plenty of opportunities for you to ask your students to share how they got ready for their first day of school, the worries that they had, and the dreams that they had the night before. 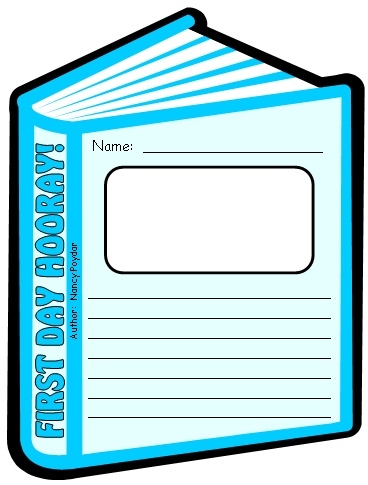 After reading this book aloud to my students, I share with them how I prepared for the first day of school, the things that I was nervous about, and everything that I was excited about. 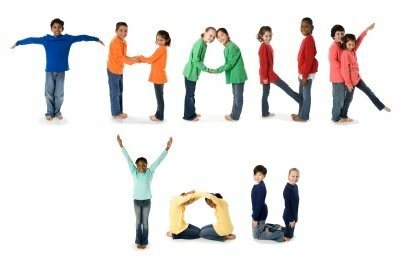 I would have my students brainstorm a list of other school employees (nurse, cafeteria workers, secretaries, librarian, etc) that work at our school and discuss their important roles and jobs. 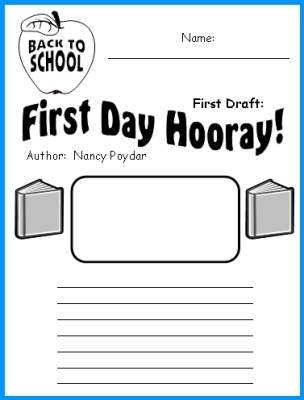 If it was possible, I would invite one or two of these school employees to stop by my classroom and share with my students how they prepared for their own first day of school. 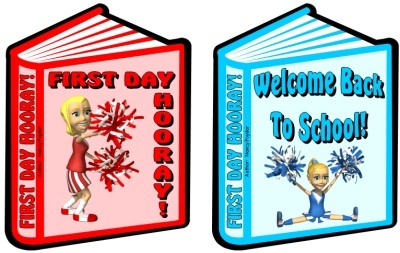 created specifically to go along with this cute back to school picture book. 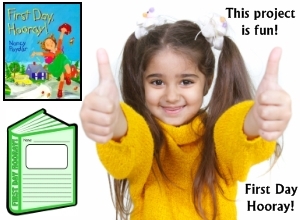 This five page banner is included for free in this set of First Day Hooray teaching resources. 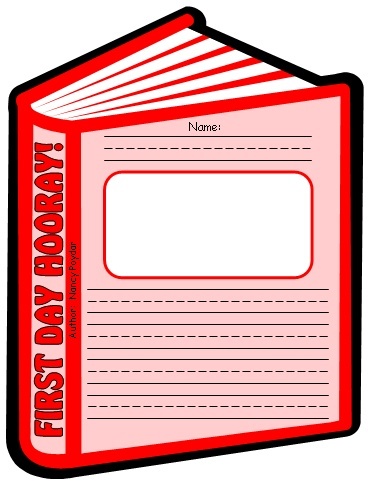 Since I feel that it is important to emphasize reading from the very first day of school, I have created book shaped templates for this set of First Day Hooray teaching resources. 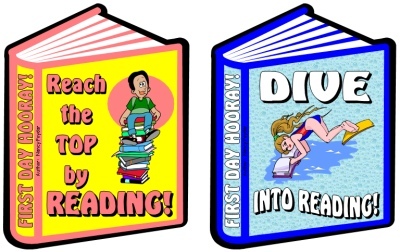 The book shaped bulletin board accent pieces (shown later on this page) that are included in this set of teaching resources have different reading slogans written on them. 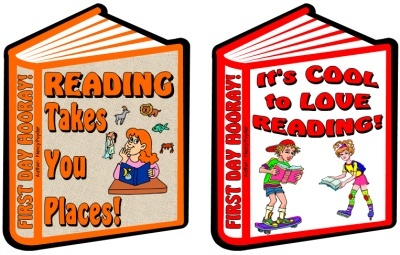 These book accent pieces and the matching bulletin board banner will help you to create a First Day Hooray bulletin board display that highlights the importance of reading. Since I am also a teacher, I understand that teachers often need to change or adapt a resource that we find to meet our own needs. I have provided 3 different versions of these book templates in order to help you select the version that would best suit your own needs. 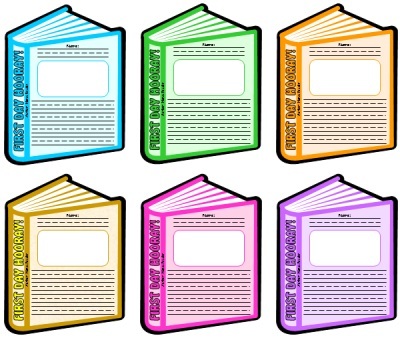 The first set of book templates has standard sized writing lines and a drawing area. Below is an example of the first draft worksheet for the first book template. This assignment will not take your students very long to complete. 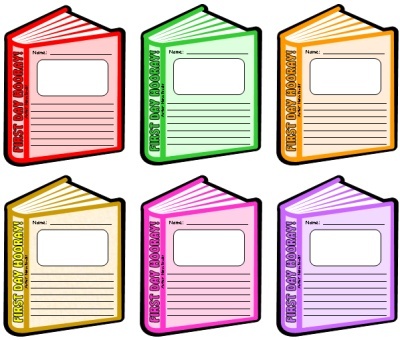 The book templates are on one worksheet and they are easy to cut out. These book templates measure 7 inches in width and 9 inches in height. 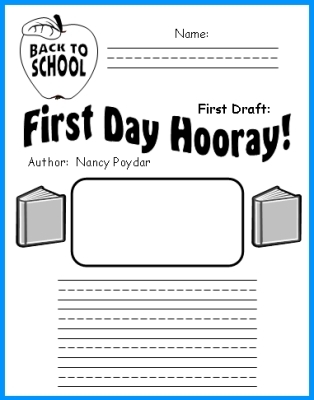 This quick creative writing assignment will provide you with student work samples that you can post on your bulletin board during the first week of school. 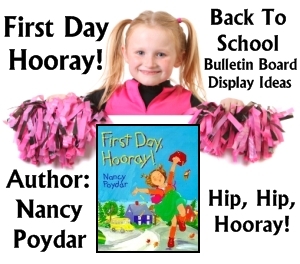 You will be able to create a dynamic Back to School classroom bulletin board display of your students' projects by using the colorful bulletin board display banner and reading accent pieces that are included in this set of First Day Hooray teaching resources. 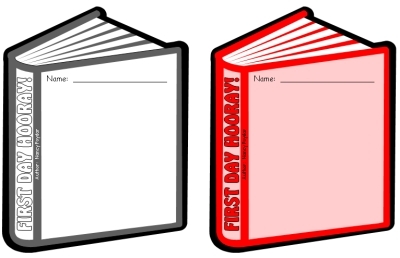 Below is an example of the first book template. red, blue, green, brown, pink, and purple. The second set of book templates has double spaced writing lines. Below is an example of the first draft worksheet for the second book template. that they can be used for a variety of different purposes. 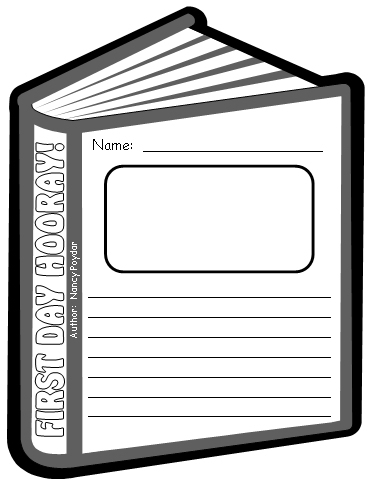 You could use these blank book templates for students to draw a picture about the story or about their first day of school. 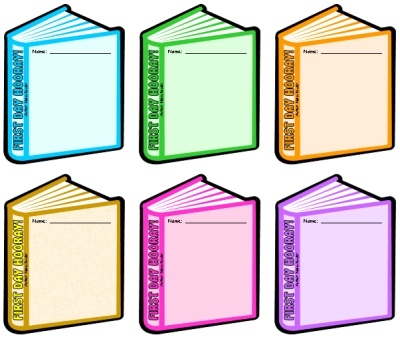 You could also use these blank book templates to glue photographs of your students. Many teachers spend hours of time cutting out large display letters or making a banner on their own at home on their computers. This time is valuable and better spent on developing your classroom curriculum, so I have designed a matching 5 page banner for your bulletin board display. You can laminate this banner so that it is more durable and you can use it again next year. 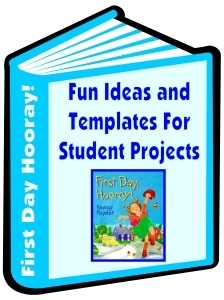 12 different book accent pieces in this set of First Day Hooray lesson plans. 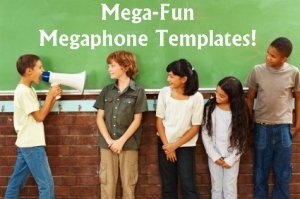 Are you looking for a fun Back to School lesson plan idea that involves your students getting to know each other? 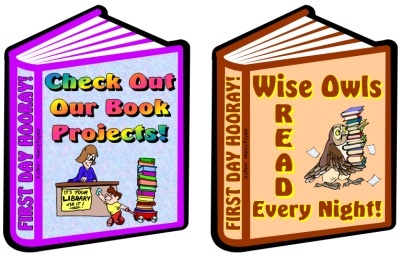 Your students will enjoy completing this unique project on the first day of school. 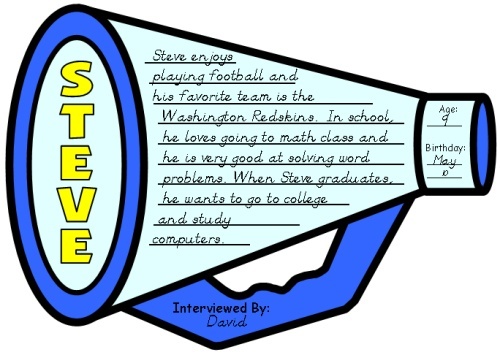 They will have fun getting to know their new classmates by interviewing them and writing about their partners inside their classmate interview megaphone templates. Thank you for visiting my First Day Hooray lesson plans page.